BRICS is an important instrument in Russia's foreign policy. The presidency gives Russia a chance to expand the economic, political and strategic scope of the five-nation grouping. The BRICS Summit, to be hosted by Russia in Ufa from July 8-10, will be the seventh meeting for the organisation since its establishment and the fifth since the four Bric countries were joined by the Republic of South Africa. Until recently, the Bric countries were united only in the imagination of former Goldman Sachs economist Jim O’Neill, who created the abbreviation in 2001 to define the fastest developing economies in the world and to offer his clients new investment opportunities (the bank immediately began offering portfolios containing the four countries’ securities). Russia has special relations with the BRICS. It was Moscow that breathed political life into the BRICS stock exchange chimera. Back in 2006, on the initiative of Russian president Vladimir Putin, the first ministerial meeting of the Bric countries was held in New York. Then in May 2009, in Ekaterinburg, Mr Putin’s successor Dmitry Medvedev hosted the bloc’s first summit. Even though there were no concrete results from that event, it had an important propaganda effect for Russia: relations with the West at the time were at a low and Moscow demonstrated to the US and the EU that it had other influential partners. In recent years, the organisation has expanded its field of activity. Besides the political image, it also began creating new international regulations. For now, BRICS is most famous for its attempt to create an alternative to the Bretton Woods international finance architecture, which is dominated by the West. Countries actively coordinate their positions on these issues in the G20. 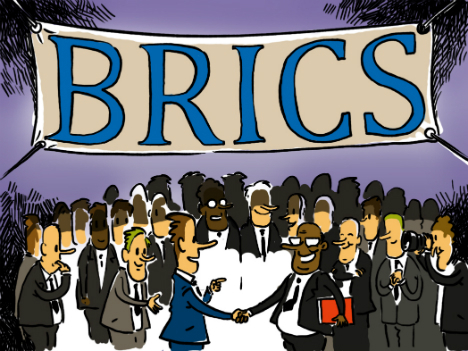 However, in 2014, when it finally became clear that the US Congress had blocked the IMF reform approved by the G20 concerning the redistribution of votes in favour of the developing countries, BRICS participants agreed to create their own bank and a pool of national currencies. In the future, this should help reduce the dependence of international finance on the dollar-euro duopoly. So far these have been the BRICS’s main achievements. A key challenge to BRICS’s effectiveness is the international structure and the specifics of its bureaucratic system. BRICS is perhaps the only association in which the leaders’ summits do not represent the crowning of the presidency, but rather its beginning. Thus, one country prepares the agenda throughout the year, while another country make the decisions. Due to a lack of synchronisation, many initiatives remained poorly developed. The article is abridged. Read the full version at Asia.RBTH.com.